The "Zeeeeke" calls came before the snap when the Dallas Cowboys were in scoring range in the first half against Cincinnati, the crowd anticipating another touchdown for Ezekiel Elliott. While his fellow rookie, quarterback Dak Prescott, ran in for the score on that possession, Elliott dazzled again before Dallas fans had a chance to settle back in at the start of the second half. 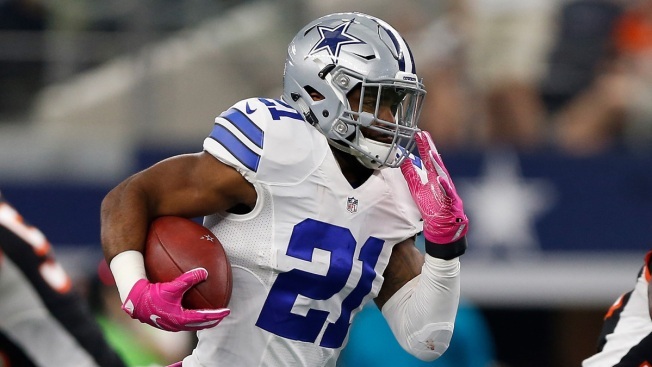 His career-long run of 60 yards on Dallas' first offensive play of the third quarter was the punctuating touchdown in a 28-14 victory over the Bengals on Sunday, and gave the game a breakout feel for the fourth overall pick in the draft even though he was already the NFL's leading rusher coming in. "We've been waiting on that home run threat," said Elliott, who had 134 yards to give him 546 yards through five games. "I think I'm progressing really well. I'm happy with the place I'm at right now. But definitely not content." Prescott threw for 227 yards, making him and Elliott the first rookie combo in NFL history with at least 1,000 yards passing and at least 500 yards rushing in the first five games. Prescott, with four straight wins subbing for the injured Tony Romo, has 1,239 yards passing. While Prescott was efficient once again while securing the rookie record for pass attempts without an interception to start a career (now at 155), Elliott had the crowd buzzing from the start. He carried four times for 42 yards on the opening drive, the final 13 for the touchdown that sent Dallas (4-1) on its way to a 28-0 lead. The 21-year-old former Ohio State star is the first Dallas rookie with three straight 100-yard games, a feat that eluded Hall of Famers Tony Dorsett and Emmitt Smith, the NFL's all-time rushing leader. "He just gets better every single week," two-time Pro Bowl right guard Zack Martin said. "He just gets more comfortable, and that's a scary thing." On his first defining play in the NFL, Elliott took the handoff on the left side of the line, cut back to a huge gap up the middle and outran safeties Shawn Williams and George Iloka converging from either side. Elliott didn't stop until he reached the railing on some field-level suites, where he jumped into the arms of fans. "I mean, it looked beautiful," Elliott said. "Running backs love runs where they don't get touched, so all I had to is to turn the jets on." While Elliott sparkled in his one preseason game, running over Seattle safety Kam Chancellor on one play, his regular-season debut was rough. The Giants held him to 2.5 yards per carry. But the per-carry average has been on a steady rise since, reaching a season-high 8.9 yards against the Bengals (2-3). Elliott didn't have a run longer than 8 yards against the Giants. He had six of at least 10 yards against Cincinnati. "It was me adjusting to the system, and that's point blank, period," Elliott said. "I came from a different system and I wasn't necessarily comfortable and I really didn't have enough reps going into the first game." On long first-down runs, Elliott likes to get up and do a feeding motion with his right hand, telling his coaches to "keep feeding me." It's even rubbing off on stoic coach Jason Garrett, who mimicked it during the first half. "He was an animal, did his job, played real hard," Bengals cornerback Adam Jones said. "I take my hat off to him."